Figure is one of the coolest apps out there. You can create beats and melodies and you can export your creations to iTunes and Soundcloud. Even cooler, you copy it and past it into a large number of other apps that includes FLStudio and AudioForge. You can even connect it to other Bluetooth devices! 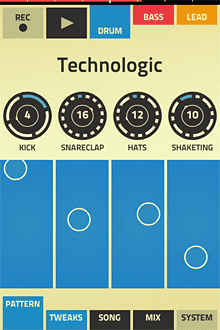 This is a great app for anybody who has a need to lay down an electronic groove quickly. You can also improv with it. I can see it being projected on a huge screen and played while a dancer(s) improvise with it. Lot's of possibilities here! If you want to experience it on either the iPhone or iPad, contact me: j.boehm@bathspa.ac.uk.